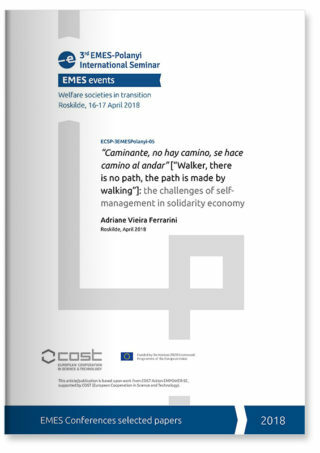 The title carries an emblematic phrase of the poem “Caminante” [Walker], written by the Spaniard Antonio Machado, especially valuable to think emancipatory and innovative processes, like those present in the solidarity economy. Among the universe of social enterprises, solidarity-based economic enterprises have the peculiarity of being carried out by workers, generally excluded from the labour market, through the socialization of the means of production and self-management. The objective of this text is to discuss the challenges of self-management in the solidarity economy, which is not restricted to democratic governance within the enterprise, but involves a political commitment to the environment and society, in a clear search for the articulation between the economy and the policy advocated by Polanyi. The work is a product of research carried out with leaders of the solidarity economy through the socio-poetic method of self-managed production of knowledge, for which all knowledge is valid and all are co-researchers. The body and emotion are also sources of knowledge, built through artistic and experiential techniques. With the use of this method, which was not widespread in the social sciences, we proposed to assume self-management – supreme principle and practice of solidarity economy – also in the production of knowledge, enabling workers to become co-researchers. Therefore, the text initially addresses the solidarity economy and contextualizes it in the Brazilian context, emphasizing the aspect of self-management. Subsequently the socio-poetic method will be presented, as well as the process and results of the research undertaken.